We don’t like black boxes. The Alternative Lending industry has expanded greatly in the past decade, and now includes a wide variety of loan platforms in which one may invest. Many of these new offerings are restricted to accredited investors, and LendingRobot Series represents an expansion of our services for the ever-changing Alternative Lending market. Thanks to the JOBs act, which introduced Rule 506(c) to Regulation D, we are allowed to share some of LendingRobot Series’ data publicly. The data we share is not an offer to sell any securities; prospective members are encouraged to carefully read the offering documents and email series@lendingrobot.com with any questions they may have. Below is the first quarter report that was recently sent to the fund’s investors. LendingRobot Series began accepting subscriptions on January 27th, 2017. The fund has been adding assets at approximately 15% per week since inception, and currently includes 32 members. Members include hedge funds, trusts, high net worth individuals, and IRAs. The first note was purchased on February 22nd. Interest is accruing from those beginning investments, and subsequently Unit values are increasing. We have been cautious and selective with our initial investments, carefully curating each Series’ portfolio with an emphasis on proper diversification. Currently, LendingRobot Series has, in aggregate, invested over 56% of its available cash. While we are happy with the quality of assets that have been purchased, we are empathetic to the short term effect that cash drag has on member returns. Consequently, we have waived management and fund fees during this initial investment period. It is expected that the collection of fees will resume during the second quarter. We are happy to announce that we have released two-factor authentication for your LendingRobot account. You can enable this security feature by logging into your account and proceeding to https://www.lendingrobot.com/#/account/two-factor-auth/. Looking forward, there are two items we’re working on for the upcoming quarter. First, the LendingRobot Series dashboard will be updated to include more in-depth analytics of the Series’ assets. This improvement will give members easier visibility into the operation of each Series. Second, we have begun the search for our next origination platform. We are particularly interested in adding a platform that aligns with our short-term portfolios. Particularly, our requirements for a new platform include data transparency, business stability, geographic diversity, and leadership in their niche. This post for LendingRobot Series (the “Fund”), is neither an offer to sell nor a solicitation of any offer to buy any securities, investment product or investment advisory services, including interests in the Fund. This post is subject to a more complete description and does not contain all of the information necessary to make an investment decision, including, but not limited to, the risks, fees and investment strategies of the Fund. Any offering may be made only pursuant to the relevant memorandum and relevant subscription documents, all of which must be read in their entirety. No offer to purchase interests will be made or accepted prior to receipt by a prospective investor of these documents and the completion of all appropriate documentation. All investors must be “accredited investors” and “qualified clients” as defined in the securities laws before they can invest in the Fund. An investment in the Fund is speculative and involves substantial risks. There can be no guarantee that the Fund will achieve its investment objectives. This document is not, and may not be relied upon in any manner as legal, tax or investment advice. Assets under management include separately managed accounts. The net fund returns shown in the table on the preceding page are calculated based on LendingRobot’s valuation of the underlying loans and the amount of interest income generated by those loans, discounted by lateness of the loans, less certain fees and expenses. 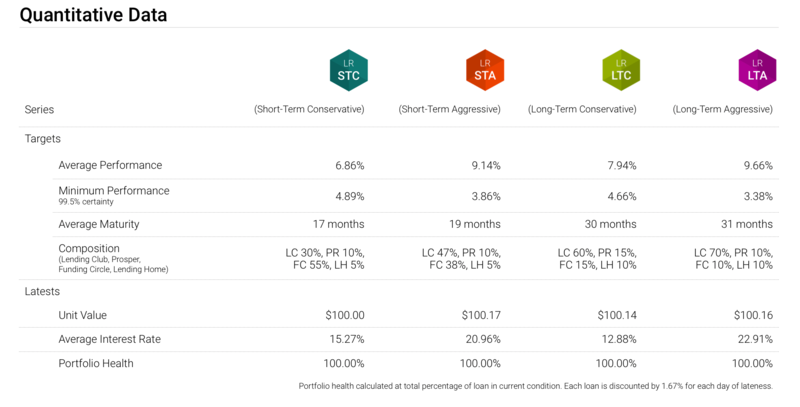 The performance data represents composite returns, and individual investor returns may vary higher or lower from the composite return due to timing of an investment and actual fees being charged. While monthly net returns and resulting statistics are as of the month noted, portfolio characteristics and associated information are as of the end of the most recent calendar quarter. PAST PERFORMANCE IS NOT NECESSARILY INDICATIVE OF FUTURE RESULTS. The potential for profit is accompanied by the possibility of loss, including the possibility of a total loss. Performance information is presented net of all expenses, including management fees, performance fees and other expenses including portfolio-related expenses. Current or future characteristics and other information may vary significantly from those provided herein and LendingRobot undertakes no obligation to notify recipients of any such variances. Please note that upon a decision to subscribe to LendingRobot Series, the investor must verify Accredited Investor status via submission of certain supporting documentation. This is required by law prior to the date of investment in the Fund.